Yep, it’s almost the most wonderful time of the year! We can already feel it in the air. You can see the hustle and bustle of people as they flock the malls and bazaars that are on sale to scout for gifts. Now that we are fast approaching the holiday season, every nook and corner are Christmas decors proudly placed not just in houses’ doors and windows but also at different business establishments. The excitement is definitely contagious! 1. When placing Christmas lights, closely inspect for any busted bulbs or sockets, also frayed or bare wires. Any broken bulbs should be replaced immediately. 2. Use only lights that have been tested and approved by DTI (Department of Trade and Industry) for safety. Look for the Import Commodity Clearance (ICC) marks . Do not invest on cheap Christmas lights. Most of the materials used are substandard which is prone to overheating and fire. 3. Read the labels carefully. If it says outdoors, then use it outdoors. Never use indoor lights outside. Always follow the instructions of the manufacturers. 5. Do not place Christmas decorations very near the Christmas lights most especially if the materials burn so easily. The decors should be flame-retardant, and non-combustible. 6. Before you retire at night or if you leave the house, always make sure that you turn off the Christmas lights. 7. For busted bulbs, you should replace it with the bulb of the same rated voltage and wattage to avoid the risk of overheating. 8. Always check your house as well for faulty electrical wires, not just the Christmas lights. 9. 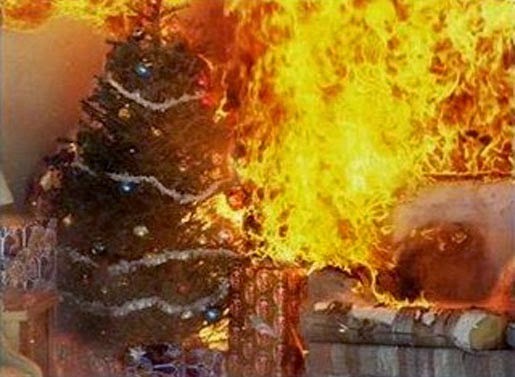 Do not place your Christmas tree near any source of heat like the television, fireplace or heater. 10. For outdoor Christmas lights, make sure that the surface where you will place it is not very dry and flammable ( like wood surface, newly painted or vanished) and is free from any water drips. Be responsible and vigilant with the use of the Christmas lighting and other decors powered by electricity. Do not take risks.This should be a great holiday for everyone and should not end up in a tragedy.The least thing that you want to happen during the holiday season is for your abode to catch fire and ended being homeless on 2015. Have a wonderful yuletide celebration!